Black, then white, then back to black again, this large light-sensitive wall clock shifts colors as day turns to dusk then dawn again- the Organic Light-Emitting Diodes display dark-colored numerals during daylight hours and light numbers into the night. 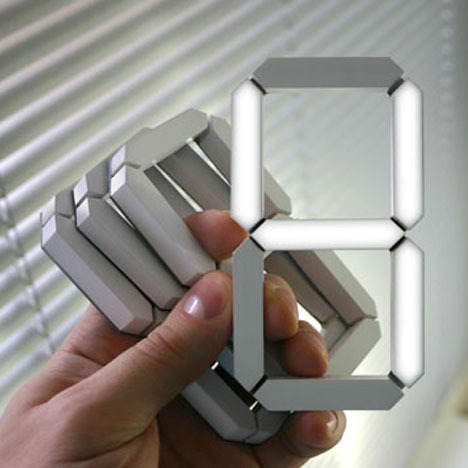 Visually, it is almost like a vertical-hung, room-illuminating, wall-surfacel version of the vintage LED wrist watch. 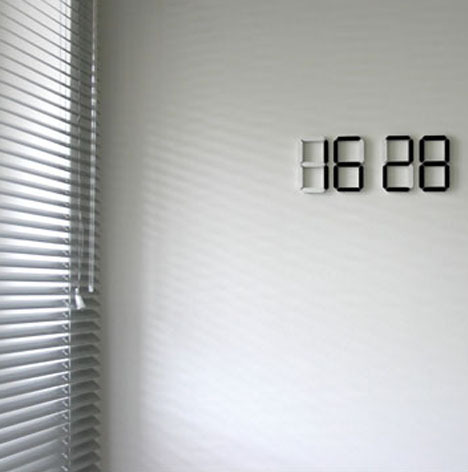 Each over-sized digital number is independently attached to a surface (and completely wire-free) so you can place and space them as you wish on any interior wall, a contemporary decorative touch that also tells time. Softly-rounded rectangular corners make these child-friendly and relatively easy to install as well – that is, once these prototypes from Kibardin Design find a manufacturer and go on sale for real. The aesthetic of the idea are recognizably patterned after the familiar giant-sized, billboard style numerals we are used to seeing on everything from small nightstand alarm clocks to huge sports scoring boards. It might not keep time at the atomic level, but its energy-efficient power system should last a long time – and cheap materials will hopefully keep the price down as well when the time comes you can buy one. 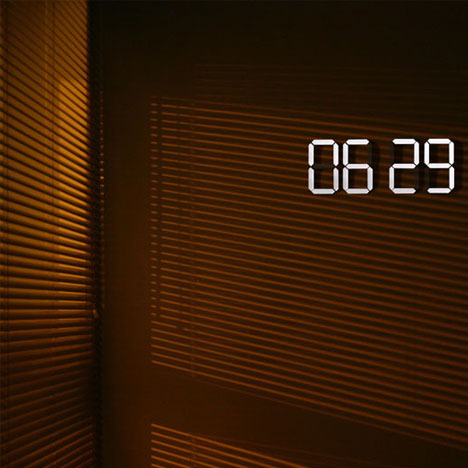 Touch-sensitive panels let you change the time without moving them. More durable than wood or glass and lighter than metal, the unique hybrid polycarbonate surface is sustainable as well as durable by design.